About a year ago, someone suggested I get involved in art therapy to help cope with some of my fibromyalgia symptoms. I was having a particularly tough time at work which had triggered a fibromyalgia flare-up (or perhaps the flare-up had triggered the tough time… that chicken and egg situation is still open for debate) and I was struggling to cope. My boss wasn’t very supportive. I was having to take more and more time off sick and the stress of it all meant I had migraines almost every day. A colleague and friend spoke to me briefly about art therapy. She recommended that I buy some big sheets of paper and bright paints and relax whilst creating beautiful pictures. I appreciated the gesture but knew art wasn’t really my thing. I’m a hopeless painter and my drawing is equally poor, and I thought I had enough stress in my life without being reminded of my artistic skills – or lack thereof. Still, I gave it some thought and over the next few days decided it could be fun. In fact, the more I thought about it the more carried away I got and it was starting to seem like a great idea. I decided I would convert the spare room into an art studio; I would buy big sheets of canvas, expensive paints, an easel, and a beautiful wooden stool. I would join an art class and invite fellow art friends around to paint and drink tea. It would be wonderful. You can probably already tell that I’d completely missed the point of all this, and predictably the art studio never happened. Even worse, neither did the art. That is, until a year later when art therapy popped back onto my radar and I approached things in a far more sensible way. Art therapy is the combination of art-making and psychotherapy, used to help individuals find comfort, relaxation, and healing from particular emotional challenges. It’s being used as a type of counseling following the widely accepted view that art provides a therapeutic outlet for creative tension. In practice, this means that we can use art therapy to cope with the frustration, depression, anxiety or anger that many of us feel as fibromyalgia sufferers. What’s more (to my relief) it requires no artistic talent whatsoever. 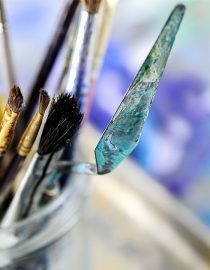 There is freedom with art therapy which means you can (no, should) paint, draw or sculpt anything your heart desires. The focus is not on the creation but is instead on the relief and relaxation you experience whilst working on your project. Next page: where to start, and how art therapy for fibromyalgia helps. I’d recommend you avoid the overzealous approach I took a year ago, and instead focus on easy realistic projects that fit in with your personality and lifestyle. Here are some easy suggestions to get you started. Remember being a child and sitting with a big A4 coloring book and a bumper pack of crayons? It’s time to do exactly that. There are lots of coloring books designed specifically for art therapy purposes for both adults and children, and they’re absolutely fantastic. I started with an animal-themed book and I’m currently working on coloring in an elaborate picture of a parrot. Then I got a book of mandalas which I expect will keep me busy well into 2015, and I bought the Ryan Gosling coloring book for a friend in the hope the combination of art therapy and his beautiful face would help her find a sense of calm. I was a bit gung-ho last year with the whole artist’s studio idea, but the large canvas and poster paint is still a good place to start. The trick is not to focus on what you’re painting or how good it is, but rather putting paintbrush to paper (or canvas) and seeing what happens next. Art therapy is supposed to be a calming process so you’re not looking to be the next Matisse or Picasso, you’re looking to get all of those emotions out of your body and onto the paper. Use bright colors as much as you can; there’s a whole theory behind ‘color psychology’ and the emotional effects of using ‘warm’ and ‘cool’ colors which you may want to read more about. Reds, oranges and yellows promote happiness, laughter and excitement whilst black and dark blues promote power, death and authority – all too serious for what we’re looking for. A friend of mine told me about an activity she does with her children to keep them busy and it’s a great one for art therapy too. Find some large sheets of paper and paint them in block colors. Let them dry then cut different shapes out of all of them. Try simple things like geometric shapes or get fancy with birds, people, and flowers. Once you’ve got a big collection of different colors, shapes and sizes, stick them onto a fresh sheet of paper. This allows you to let your creative flare run wild and get a little busier than the coloring book will allow. This activity does rely on your hands being in a good way and I often find fibromyalgia means I struggle with scissors. Perhaps make this a family activity and get the kids to help out? I only got involved with art therapy very recently, but I have noticed immediate benefits. When you’re stressed or anxious or struggling to cope, your mind tends to work overtime and you can feel like you’ve gone into meltdown mode. In these situations, you need something to distract you and that’s where art therapy comes into a league of its own. Do you ever find you try to distract yourself with TV, only to realize you’ve been staring blankly at the screen whilst your mind is a million miles away and you feel miserable? Or browse the internet, only to realize you’re reading social media posts that leave you feeling worse than you did when you started? Art therapy is clever in that it requires enough concentration to occupy your mind, but not so much concentration that you find yourself exhausted from working too hard. It’s gentle on your body and if you get bored or don’t like what you have created you just start again. I find that most evenings I sit and color whilst happily chatting away or watching TV. I notice that it’s lifted my mood and stopped me thinking about my health or my work or my many other daily stresses. Oh, the question of what to do with all that art? Throw it out. Frame it. Sell it. It really doesn’t matter. The purpose is to create it just so you can feel that sense of calm.